Pachouli is a bushy herb with erect stems, grow up to 2-3 feet, leaves are dark green, hairy, in height and bearing small, pale pink-white flowers borne in whorls, in the upper leaf axils; tubular, with five-toothed calyx; a tubular corolla with four equal lobes. The fruits are four seed like nut lets. To treat Vata, Pitta, skin disorders, common cold, varicose vein, anxiety, sexual weakness, inflammation, indigestion, rheumatism, arthritis, cough and anorexia. 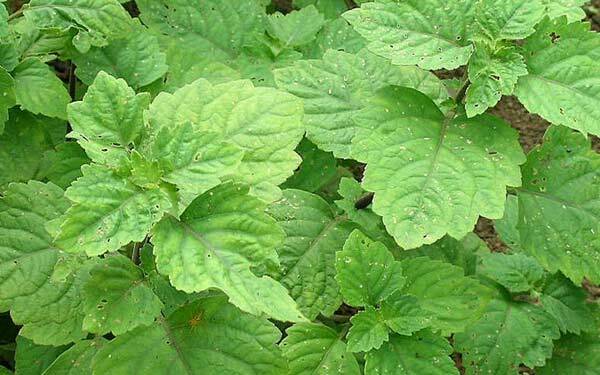 Patchoulene, caryophyllene, seychellene and a-guaiene, Sesquiterpenes constitute 40-50% of the oil of patchouli. A crystalline fraction of non-sesquiterpenes alcohol called nor- patchoulenol has been isolated and found to be the true odour carrier of the oil of patchouli.